Known as the "Father of the United States Space Program", Wernher von Braun is revered for his contributions to the United States. But when details about "Operation Paperclip" were released to the public, even the most adoring fans cowered in the shadow of his gruesome past. A member of the Schutzstaffel (Hitler's "bodyguards" who became the most feared group in Europe), von Braun developed the A-4 for the Nazis, which would rain explosives on London. By the time it was used, he renamed it Vergeltungswaffe-2 or "Retaliation and Vengence Weapon 2". Not only was his technology used to crush the Allied forces, but von Braun used concentration camp prisoners as slave laborers, handpicking them from the camps and sending them to their underground hell, known as Camp Dora. close that he almost touched the bodies." Twenty thousand slave laborers died building the V-2 for Hitler's regime. 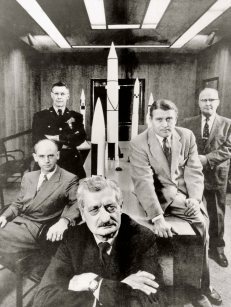 Von Braun was arrested by the Nazi regime for being an alleged traitor to the cause, but was acquitted in order to advance the V-2 program. He was eventually rounded up by the US military so that he could develop new technology for the government, confidently assuming "he would not be kicked in the teeth because the V-2 was something we had and you didn't". His files labeled him a 'security risk', but the intelligence agency ensured his crimes were concealed because the Cold War was in full swing, and defeat was not an option.